This detailed information serves as a molecular-level structural visualisation, allowing scientists to study several potential targets for antiviral therapies or drugs. In order to create a drug which can target viruses, researchers need to know what the virus looks like. With this knowledge, they can target chemical compounds at it in such a way that they bond with it precisely, stopping the virus from working. The more detailed the structure they have to work with, the more precision they can apply. 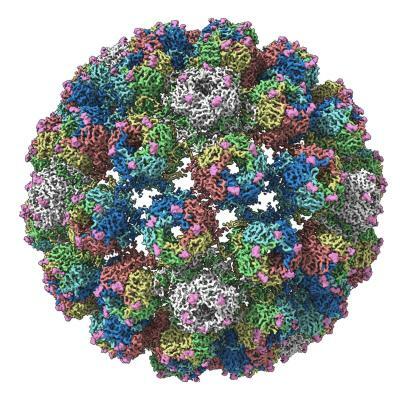 The research team at the University's Astbury Centre for Structural Molecular Biology focused on the infectious BK polyomavirus (BKV), using the centre's two cryo-electron microscopes to develop the incredibly detailed imaging required. A research paper announcing the new structures has been published in the journal Structure. The level of detail in the image allows scientists to see features on the virus as tiny as ~3 Ångströms wide. One Ångström is equivalent to one ten-billionth of a metre or 0.1 nanometre. The structure is so small it cannot be seen by the naked eye. Astbury Centre PhD researcher Dan Hurdiss, lead author of the paper, said: "Our structures provide the clearest picture to date of the infectious virus particle. This detailed information serves as a structural roadmap, allowing us to visualise several potential targets for antiviral therapies. "These may include drugs which block BKV from entering our cells or which prevent proper assembly of the virus particle. Going forward, these structures may also be used to identify how antibodies from patients with other diseases recognise the BKV virus particle and thus aid in the development of a vaccine." About 80% of the world's adult population is infected with BKV, but the virus rarely causes illness in people with a healthy immune system. However, in immunocompromised individuals, BKV can 'reactivate' and cause serious diseases. Two such examples of BKV-associated diseases are polyomavirus-associated nephropathy (PVAN) and haemorrhagic cystitis (HC) which affect kidney and bone marrow transplant recipients respectively. Around 10% of people who receive a kidney transplant will suffer from PVAN and up to 90% of these will go on to have their transplant organs rejected. At present, there are limited treatment options available for individuals suffering from BKV associated diseases. The new structures will give hope to sufferers, by giving scientists a better-quality research tool to work with. The structures were created using the cryo-electron microscopy method, by freezing infectious BKV particles and taking thousands of images using the microscopes. These two-dimensional images were then combined computationally to produce a high-resolution, three-dimensional view of the virus. Professor Neil Ranson, Director of Cryo-Electron Microscopy at the University of Leeds, said: "Cryo-electron microscopy has been around for 30 years and has been incredibly useful, but until recently the technology lacked the ability to routinely look at molecules at the level of detail needed. "Without that detail, scientists sometimes struggled to understand the structure of biological molecules and how they function, especially when they are in their normal workplace: inside our cells. "However, the Titan Krios microscopes we have installed in Leeds are absolutely state-of-the-art, and mean that these limitations have been shattered. Researchers and industry users who work with us can now image biological molecules with an incredible resolution. Crucially, we'll also be able to see how these molecules interact with each other." The BK Polyomavirus structure research was funded by Wellcome, Kidney Research UK and Kidney Research Yorkshire. Photos and film footage of the microscopes is also available, as is a copy of the BK polyomavirus structure. The DOI number of the research paper is DOI: 10.1016/j.str.2018.03.019, it will be live after the article is published 12.00pm EST / 5pm UK time on 26 April 2018.